On January 14, 2019, S Magazine released an article featuring the ongoing artistic collaboration between Mark de Paola and model and artist, Ema McKie. The interview also features highlights about de Paola’s artistic inspirations, creative process, and his recent acceptance of Recent Work in the Museum of Modern Art, New York City. CLICK HERE to view the editorial and article. The Leica Camera TL2 Commercial "Unparalleled Beauty" directed by Mark de Paola was launched today to a worldwide audience. "Minimalist design, compelling qualities inside. The new, second-generation Leica TL2 sets standards and takes this camera class into an entirely new dimension. "Art of Backstage" was recently reviewed on LiveFAST Magazine. Mark's newest series "Art of Backstage" will open the brand new Leica Gallery and store, GINZA SIX, on April 18th, 2017. The show will run through June 13th, 2017. CLICK HERE for more information. Mark de Paola and the dePAOLA Pictures team presented the abridged "Photography Wide Open" Masters Workshop to a group of Leica Akademie Japan students on December 11, 2016. De Paola presented the talk through a Japanese Interpreter allowing audience members to understand the technical and nuanced information simultaneously in Japanese and English. On Thursday, December 8th, 2016 Mark de Paola and Leica Gallery Ginza team in Tokyo, Japan presented a brand new curation of the "60 Seconds" series to the public. The show was a curation of fourteen 16"X20" prints shown to a packed audience. The show will be on display at the Leica Gallery Ginza through February 28th, 2017. Mark de Paola's "60 Seconds" series will open at the Leica Gallery Ginza on December 8, 2016 from 6pm to 8pm. The exhibition will be a brand new curation of the series with prints sizing 16 inches by 20 inches. The show will run through February 28th, 2017. Mark de Paola and the dePAOLA Pictures team joined the New York Film Academy Photography majors at Burbank Studios Wednesday for a Masterclass Intensive. De Paola challenged the students with a wide range of imagery and discussion as well as studio exercises. On November 5th, 2016 Mark de Paola and the dePAOLA Pictures gave a sold out Masters Workshop with the Leica Akademie. Attendees were immersed into the world of "Photography Wide Open", challenging their own philosophical and photographic beliefs. Last weekend, Mark de Paola and the dePAOLA Pictures team participated as part of the Leica Akademie's programming at the annual Photoville Festival in Brooklyn, New York. The festivities began Friday for the first ever #printstameet with Leica Camera, followed by Mark de Paola's talk "Photography Wide Open" at the Leica Akademie tent. Saturday was in full force with Leica's panel discussion "See the Bigger Picture: Defining Your Style as a Photographer in the Digital Age" with Mark de Paola alongside photographers Ralph Gibson, Joshua Allen Harris, Van Styles, and moderator Stephen Pulvirent. "60 Seconds" by Mark de Paola will open this fall on Thursday, November 3rd and will be the second solo show for the gallery following Magnum photographer Constantine Manos. Join us November 3rd for the opening reception of "60 Seconds"! The official RSVP will be released soon. 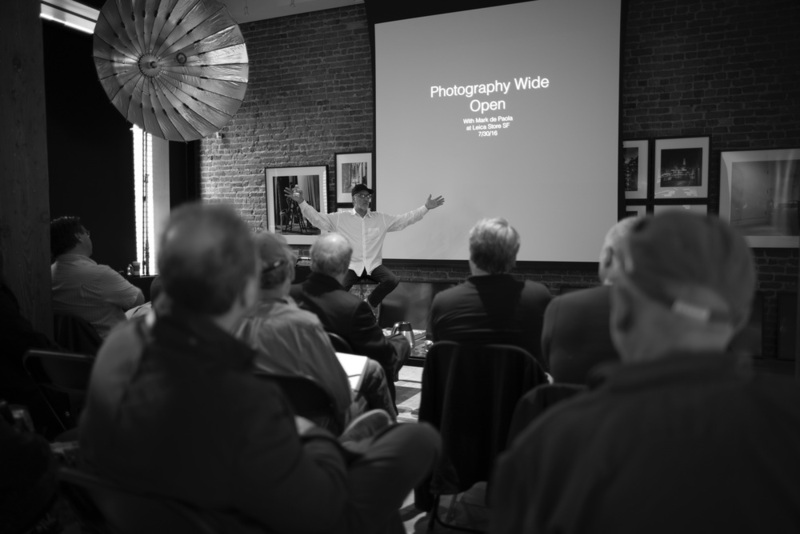 On July 30th, Mark de Paola gave an exclusive one day workshop, "Photography Wide Open" at Leica Store San Francisco. The day was filled with intense conversation and guided exercises in interior and exterior environments. Check out our "Events" page for more information on upcoming talks and workshops! On July 29th Mark de Paola revealed the secrets of Kubrick's magical relationship with cameras and lenses. The dePAOLA Pictures Team has partnered with Alzheimer's Greater Los Angeles to make a difference in the lives of those with and affected by Alzheimer's disease. Images from Mark de Paola's "Art Of Backstage" series were recently featured in the July 2016 Issue of Peluquerias Magazine, based in Spain. This series of images was from the Naeem Khan FW16 collection. Sunday, July 10th Mark de Paola spoke at Leica Gallery Los Angeles for their "Coffee, Cameras, and Conversation" series where de Paola will shared an abridged version of his "The Way I See It" lecture as well as his background and insight into photography, and as the concept and artistic process behind "60 Seconds". "COOPH", the Cooperative of Photography, recently featured a selection of images from Mark de Paola's "60 Seconds" series as well as more information about his current solo exhibition at the Leica Gallery Los Angeles. LiveFAST Magazine Reviews Mark de Paola's Series "60 Seconds"
Mark de Paola gives an in depth insight into his artistic process and the ideas behind the "60 Seconds" series, now up at the Leica Gallery Los Angeles through July 18th, 2016. "The inspiration and drive behind the "60 Seconds" project was an exploration of my own spiritual, philosophical, and photographic intimacy and...". Mark de Paola's "60 Seconds" series will be featured as a solo exhibition at Leica Gallery Los Angeles, curated by Gallery Director Paris Chong, this summer June 16th through July 18th. The opening reception is June 16th from 6pm to 9pm where attendees will be able to mingle among the series with the artist himself from 6pm to 8pm. Official press release to be released soon. Mark de Paola was recently given the opportunity to test the new Leica S007 Camera for a week in New York City. One photograph from each day on the job was featured on the official Leica Camera USA account displaying the camera's incredible versatility in rendering fashion, still life, and fine art photographic work. Mark de Paola was asked to discuss his artistic process in the conception of the "60 Seconds" project. CLICK HERE to view. Mark de Paola's work was recently featured on the official @leicacamerausa Instagram account featuring his backstage work during New York Fashion Week FW16. Mark de Paola was interviewed by LFI Magazine about his latest fine art series, "60 Seconds". Special thanks to Alex Ramos, Sean and Diana Cranor, Frank Lohstöter, Katrin Iwanczuk, and Simon Schwarzer for making this feature possible. "Keep still and, if possible, don’t even breathe – for a whole minute that is: for his new 60 Seconds series, photographer and director Mark de Paola took all the pictures with an exposure time of 60 seconds – and without using a tripod. The outcome is abstract figures, flowing forms and poetic compositions. 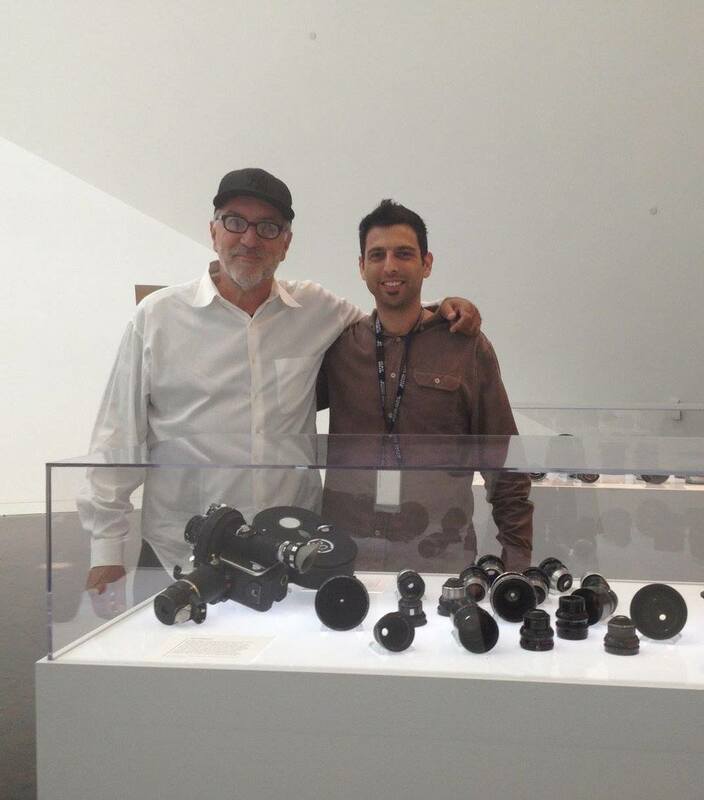 The series will remain on display at the Leica Store San Francisco, up until February 21. Within the framework of the exhibition, there will be a reception attended by the artist on January 14."